D3 (or D3.js) is a jаvascript library for visualizing data using web standards. It helps you bring data to life using SVG, Canvas, and HTML by combining powerful visualization and interaction techniques. In this course, you’ll learn about SVG, see how D3.js offers a comprehensive set of visualization tools for your data analysis goals, and how to use these tools. You’ll load data internally or externally while creating stunning data visualizations using D3 and SVG. You’ll build line graphs, scatter plots, area charts, interactive tree diagrams, and customize your own map. You’ll also understand and use methods, functions, layouts, and selections to manipulate the DOM using D3. Finally, you’ll understand the enter and exist modes, the click and update functions, projections, and the Geojson format in D3 V5. 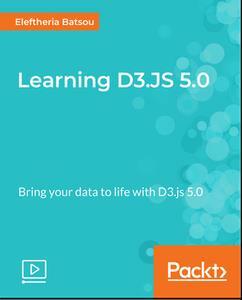 By the end of this course, you’ll have learned some exciting tips, best practices, and techniques for your data representation and data analysis and will be able to build your own data models with D3.js much faster and with ease.